There are many coffee subscription companies out there, in the first of a new series on Coffee Lovers TV, I’m going to introduce you to a few of my favorites. On the surface, most of these companies have a similar core. They offer you sample boxes, subscriptions, and single offering purchases of a collection of roasters. Since all these companies are pulling from high-quality roasters, the relative quality of the roasted coffee is going to be equal across each company. What you get is the uniqueness of the roasters themselves, plus the uniqueness of the company providing them. 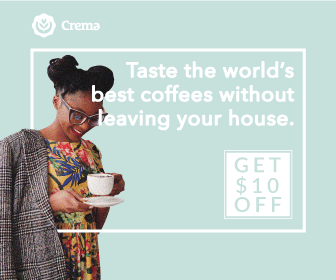 I’ve had coffee via Crema in the past – in fact, I subscribed for a little bit to see what it’s all about. Crema’s focus is on single offerings of coffee. When you subscribe you get your first chosen bag of coffee, and then ever X days (whatever the frequency is you chose) you get the next coffee you’ve set in your list (kind of like old school Netflix…does physical netflix still exist even?). One of the fun things with Crema is that when you begin, you can answer a couple questions to narrow down where to start. This is one of the greatest challenges in coffee. With all the choices to be had, and all the uniqueness to be found – where do you begin as a coffee drinker? And as someone on the other side as well, how are we to recommend something to you? So, on Crema you get to answer a couple questions and then narrow down your choice a bit – it gives you a better shot of finding something you will enjoy. I’ll say first off there are two challenges with this. The questions depend on my subjective analysis of my own taste, and the roaster’s subjective analysis of what their coffee tastes like. I recall the first time I did this, it was a liiitle bit hit and miss – but then again I’m a picky taster. In the video preview here, Crema sent me a sample box, featuring 4 different roasters. I’m not 100% sure if this is something they are offering customers, but if they are, I’d say that’s a pretty darn good idea. It’s much easier to figure out what I enjoy if I can taste 4 different things at once. I’m happy to say that all the coffees in this sampler were quite well done – and the sample box itself presented an excellent range of taste options (perhaps they will be able to narrow down your choices depending on the initial questionnaire? ).